The TKR-750/850 repeater is available in both VHF and UHF frequency bands, and with its 25 watt power output, can deliver excellent performance without the need for an expensive external power amplifier. With space for an internally mounted power supply and duplexer, this unit can be used as a self-contained desktop station, or easily transported to satisfy temporary needs or for tactical deployment in an emergency. This rack mountable repeater is a proven dependable performer when deployed on-site or at remote mountaintop locations. 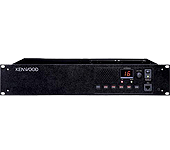 When deployed with a high-output power amplifier and logic panel, this repeater can provide wide area and advanced trunking operation.